The Oregon Coast winter is motion. Waves, gales, tides, rain smearing glass and draining to bays and creeks and rivers, flushing into the cold Pacific. Gulls surf and swoop in spindrift above big swells, sheer and roiling and loud, bashing ancient rock and sea stacks. It’s a common but always magical sight to behold. Yet gulls are not winter’s only wildlife. 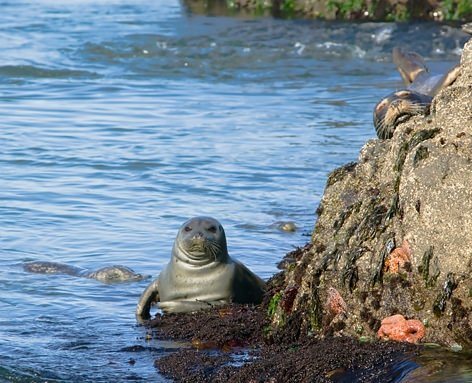 This season, which is largely undiscovered for wildlife viewing, head to the Coast for some of the state’s most compelling critters — dozens of species of migratory birds, tidepools teeming with life, thousands of whales and boisterous sea lions. What’s not to love? See for yourself. 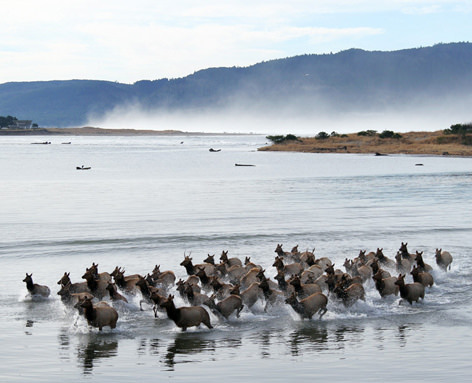 Rife with history and marking the mouth of the mighty Columbia River, this 4,300-acre military monument has no shortage of animals. Among forests, wetlands and dunes are 6 miles of hiking trails; waterfront viewing platforms allow easy access to all sorts of wintery fauna, including Roosevelt elk, harbor seals, great blue herons, auklets, beavers and bald eagles, plus thousands of migrating shorebirds. Nearest town: Astoria. 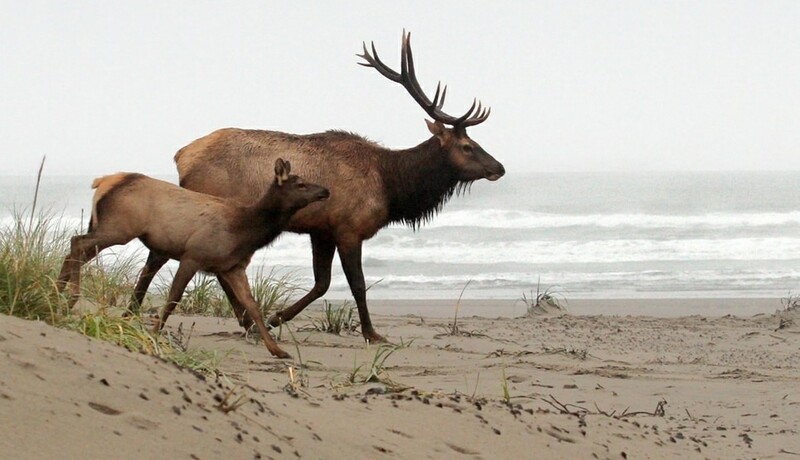 Crowned by iconic Tillamook Head, these 9 miles of beach, Sitka forest, bluffs and sea stacks present myriad wildlife-spotting opportunities. Vista points, an abandoned lighthouse, wooded headlands and the sandy shore host park wildlife such as Roosevelt elk, deer and raptors. The scenic vantage overlooking Indian Beach (south of Tillamook Head) is nice for spotting gray whales during spring (peaks in March) and winter (peaks in December) migrations. Nearest town: Cannon Beach. Splitting Tillamook Bay from the Pacific, this diverse spread of sand and flora was once slated to become the West’s version of Atlantic City. Mother Nature intervened, leaving quiet Bayocean Spit to us with its excellent birdwatching opportunities, from sanderlings to scoters at the water’s edge, to terns, osprey and herons in the bay. 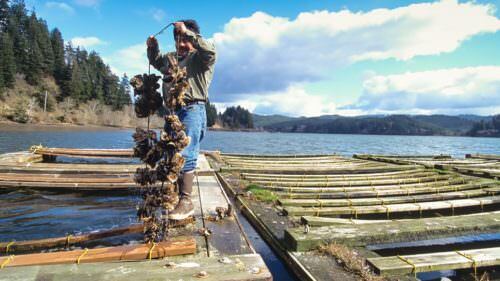 Nearest town: Tillamook. Old-growth-forested with several viewpoints (including a photogenic lighthouse) perched 200 feet above the sea; highly valuable for watching gray whales (both migrating and resident); humpbacks, orcas and sperm whales can be seen here during their yearly migrations to/from Alaska. 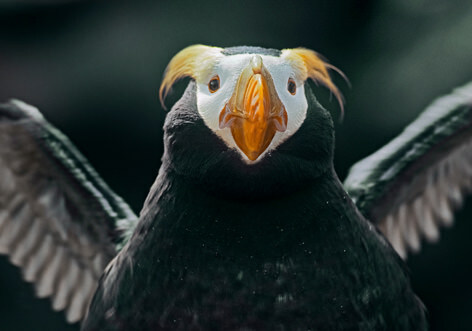 Also fascinating is Oregon’s biggest breeding colony of tufted puffins. Binoculars required. Nearest town: Tillamook. Visit and you’ll quickly agree that “outstanding” is an accurate way to describe this hook-shaped basalt headland poking a mile into the Pacific. Explore its forests, islands and sheltered pocket beaches, all with handy interpretive signs and viewing platforms. 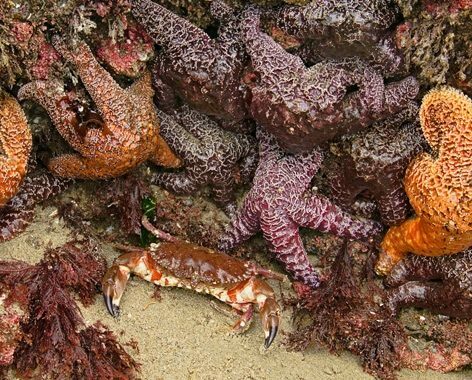 Many seabird species and migrating gray whales complement the year-round, harbor-seal refuge just offshore; if tidepooling is your thing, large green anemones, purple urchins and orange sea stars add colorful accents to the barnacle-caked rocks. Nearest town: Newport. You don’t have to be outdoors to see wildlife — the Cape Perpetua Visitor Center affords stellar views of the Pacific, where gray whales are often seen passing. But once outside, you can choose from several trails, either up the hills or down to the beach. Both offer wildlife watching, from teeming tidepools to enchanting old-growth Sitka forests — from anemones to eagles, if you will, and everything between. The visitor center is open year-round. Nearest town: Yachats. One of the world’s most scenic (and photographed) lighthouses rests between ocean and forest atop Cape Creek. Here you can see puffins, cormorants, common murres, and oystercatchers resting on sea stacks and in cliffside nooks. Whales and sea lions are viewed frequently, as are brown pelicans and bald eagles. At low tide, Cape Cove opens for tidepooling and shorebird spotting. Nearest town: Florence. Along this vast stretch of dunes and “tree islands” is this special little zone of sandy beach, tidal flats and wetlands, particularly good for birding. Shore-dwellers include long-billed curlews, yellowlegs, sandpipers and plovers, while the wetlands typically showcase red-tailed hawks, northern harriers, tundra swans, marsh wrens, yellow-rumped warblers and white-tailed kites. Nearest town: Florence. 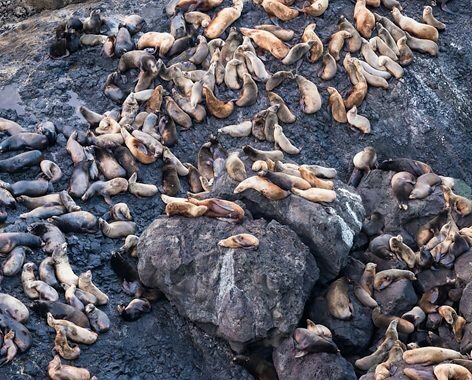 A rich collection of offshore rocks, reefs and islands serves as breeding/resting sites for a host of life, notably northern elephant seals, the largest of the seal species and the world’s deepest-diving mammal. More common mammals seen here are sea lions (California and Stellar), harbor seals, plus southerly migrating gray whales. Some of our winged friends here include pelagic cormorants, black oystercatchers, and osprey. Nearest town: Charleston. This headland oversees a stunning collection of rocks, tidepools and sea stacks that is home to thousands of marine mammals and seabirds, the latter majority being common murres. The flat, paved interpretive trail is highly useful. Also present are black oystercatchers, Leach’s storm-petrels, Western gulls, pigeon guillemots, tufted puffins and Brandt’s cormorants. 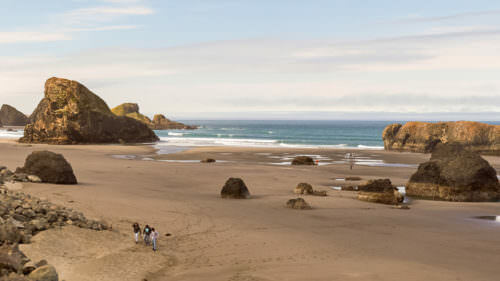 Nearest town: Bandon. The second-westernmost (and likely windiest) point in the lower 48, Cape Blanco lies at the end of a 6-mile road west from Highway 101. 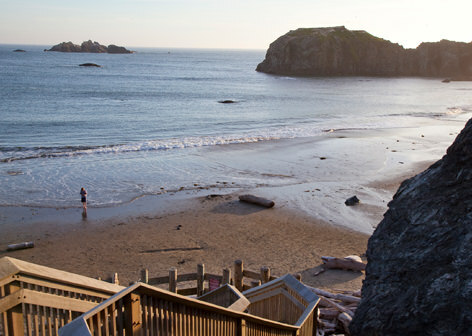 Its eponymous 1,880-acre park is home to a variety of wildlife, from tidepools to tundra, sea stacks to Sitka. Near the water, you may see scoters, grebes, loons and marbled murrelets. In the fields, you might find bluebirds and raptors such as harriers and kites. In the ocean, you might see breaching gray whales and an abundance of pinnipeds. Just don’t forget your windbreaker. Nearest town: Port Orford. Facing Oregon’s biggest island (Bird Island, aka Goat Island), Harris hosts a National Wildlife Sanctuary, a nesting site for tufted puffins, Leach’s storm-petrels and many other seabirds. The cliffs above the beach are prime spots for viewing gray whales. The beach itself is chockablock with rocks and tidepools and shifting sands. 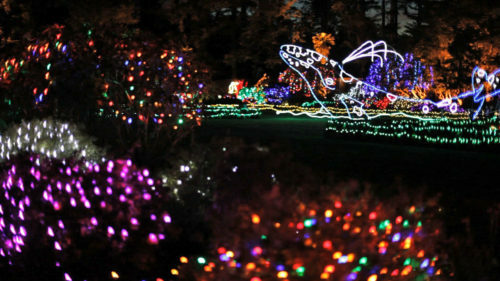 In the forests above, you’ll find deer, quail, rabbits and all sorts of raptors, the scene scented with cozy campfire smoke. Nearest town: Brookings.